Greece Soccer Team - EURO 2004 Champions - Stylianos Giannakopoulos - by La Cancha-News On World Cup 2006 - "World's Leading Soccer Magazine!" A wily attacking player with an unerring ability to shoot from range, Stylianos Giannakopoulos's most potent attacking asset remains his habit of making late surging runs into the penalty area. Giannakopoulos first represented Greece when coming off the bench in a match against Cyprus in March 1997 and went on to play a part in the unsuccessful attempts to qualify for the 2000 UEFA European Championship and the 2002 FIFA World Cup; disappointments subsequently tempered by the Greeks' stylish passage to Portugal. Giannakopoulos appeared in all eight qualifiers, writing himself into Greek footballing folklore with his superb 20-metre drive against Spain in Zaragoza, a winning goal which set the tone for Greece finishing at the Group 6 summit. His debut season in professional football in 1992/93 was a personal triumph - Giannakopoulos scored six times in 32 games - but disappointing for his club, Ethnikos Asteras FC, who narrowly missed out on promotion from the third division south. He then moved on to Paniliakos FC and enjoyed three wonderful seasons which included two promotions and a campaign of consolidation in the top flight. 1996: Signed by Olympiacos CFP as they sought a first championship since 1986/87, Giannakopoulos and co delivered in emphatic style, winning seven titles in succession prior to the player's departure to Bolton Wanderers FC on a three-year contract in summer 2003. 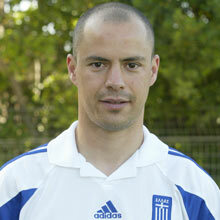 Giannakopoulos's influence in Athens was never more keenly felt than during his final season, when he scored a personal best 15 goals and was named the Greek Footballer of the Year. He also struck what many regarded as the goal of the tournament against FC Porto in the 1998/99 UEFA Champions League. 2003/04: Enjoyed a solid first season in the Premiership, scoring twice in 31 games. Giannakopoulos also appeared as a late substitute in the League Cup final which Bolton lost 2-1 to Middlesbrough FC. He supported Panathinaikos FC as a youngster, prompting some envious looks from the green side of Athens during his time with Olympiacos.